One of my goals, when I started this site, was to inspire. Inspiration is a lofty goal, but charitable giving is one area where I love to see others follow my lead. A month ago, I shared the news of my gift of $100,000 with you, and I am happy to report that several of you were indeed inspired to contribute handsomely to newly founded donor-advised funds (DAFs) of your own. Via the comments section and e-mail, I heard from at least five readers who started them, two of whom also reported giving $100,000. Some of those readers were bloggers. Many other bloggers were already on board. This is a list of personal finance bloggers who have started their own DAFs and written about them. 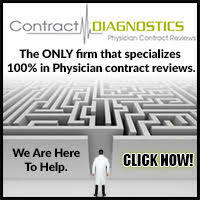 You’ll notice The White Coat Investor does not appear on this list [yet. Stay tuned. -ed] He and I wrote a pro/con piece on the merits of a DAF. I think I won that debate, and he probably disagrees. I’ll let you decide. Today, I’d like to look at the flip side of DAF giving. So far, I’ve focused on getting money into a DAF and the tax benefits that result from your generosity. Today, I will demonstrate how to share that money by giving from the DAF directly to charitable organizations. One benefit of DAF giving that is often overlooked is how easy it is to give grants to the charities you wish to support. The fact that you don’t have to keep track of your grants given for tax purposes no matter how often you give or to how many different organizations is a true blessing. A DAF can save a prolific giver a ton of time. My first DAF was with T. Rowe Price, but several years ago I made a transition, moving pretty much all of my retirement and donated dollars from T. Rowe Price to Vanguard. The price of admission to get started with Vanguard Charitable is $25,000, and the minimum grant is $500. 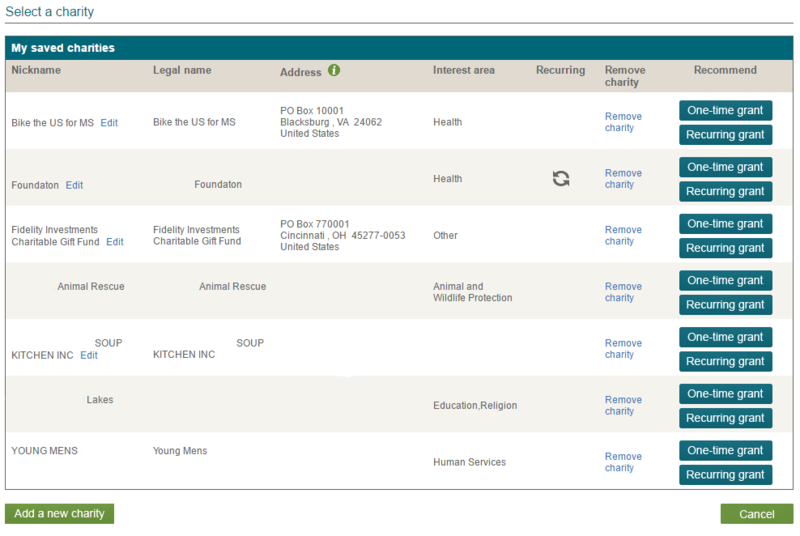 Next, you will see a screen that includes charities that have benefitted from previous giving. If this is a repeat gift, simply select “One-time grant” next to the charity. 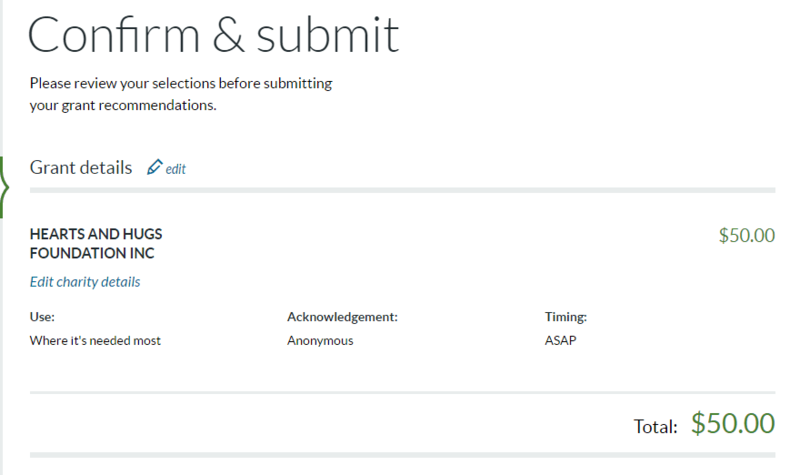 To set up a recurrent grant on a schedule, as I’ve done indicated by the 2 arrows forming a circle, you can select “Recurring grant” to assign a dollar amount and frequency. You’ll notice that Fidelity Charitable is on this list. For reasons that I will detail later, I donated from one DAF to establish another. Both are 501(c)(3) charities, so you are allowed to transfer money between them. 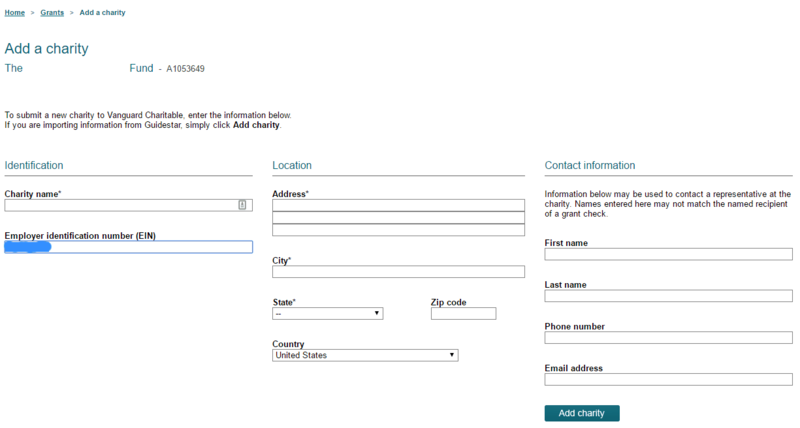 You’ll have an opportunity to perform a search of over a million charities via Guidestar. If the search yields a successful result, the information will be imported. If the search is fruitless, you can still donate as long as the recipient is registered as a 501(c)(3) charity. You’ll need the charity’s name, EIN, and address. In this case, I filled out the form manually, as the Guidestar search did not find the particular charity I was looking for. 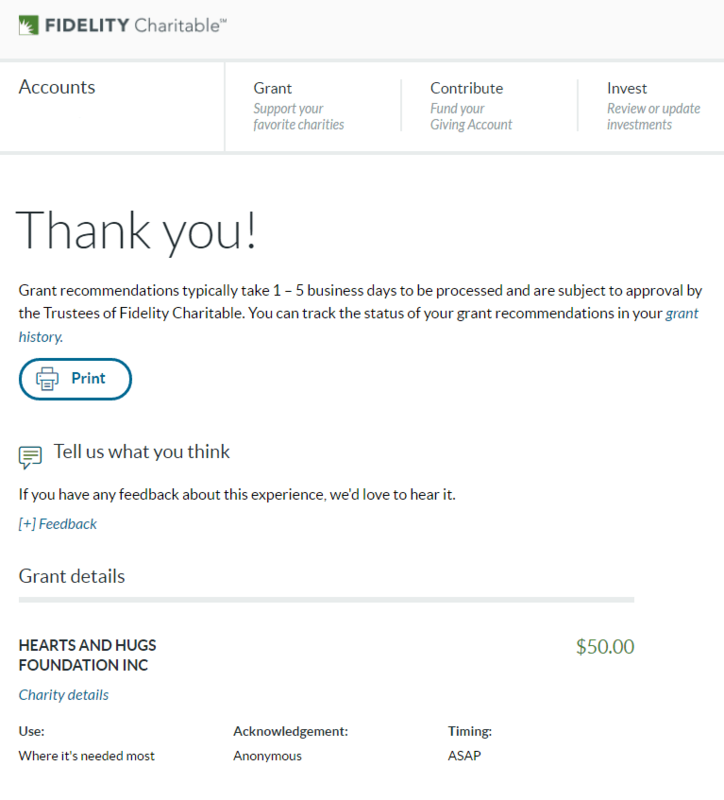 I contacted the charity to obtain the EIN and official name of the charitable organization, and was good to go. 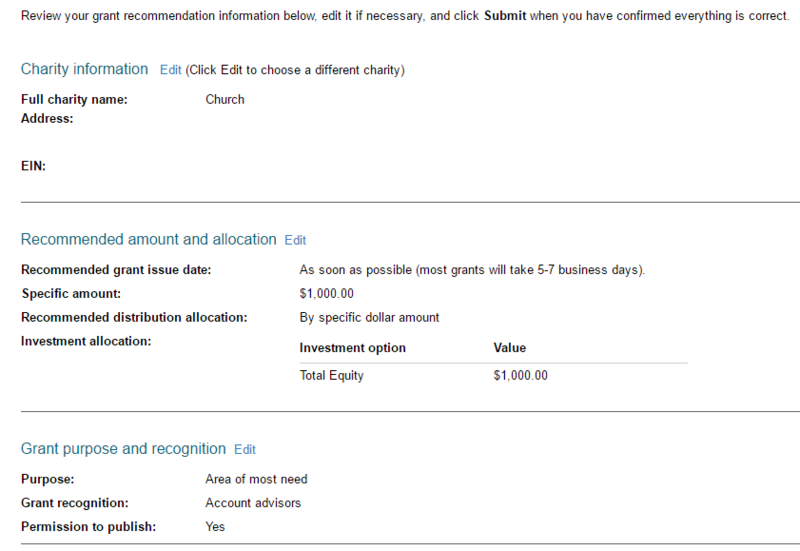 Once you’ve clicked on Add charity, you will choose the amount to donate and from which allocation. 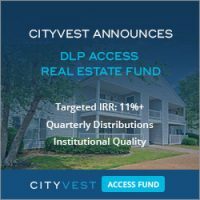 Since all my DAF dollars are invested in the Total Equity fund (55% S&P 500, 15% extended market, 30% international), my donation will come from there. You can choose when to donate, but I chose “As soon as possible,” so the check should arrive this calendar year. 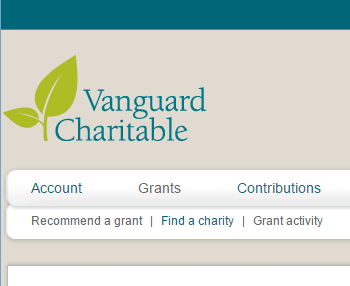 Once you’ve typed enough zeroes — and remember, with Vanguard Charitable, the minimum grant is $500 — click “Next“. This page is your confirmation, which will be followed up with a letter you receive in the mail from Vanguard Charitable, and likely one from the charity itself. In my experience, the thank you / confirmation from the charity will thank you for your tax deductible contribution and advise you to retain the letter as a receipt. Note that you cannot deduct your grants for a tax deduction. You only get to do that once, and that’s when you donate to the DAF. There is no additional tax benefit to giving from the DAF, regardless of what the Thank You letter irresponsibly states. Like a tortilla chip into seven-layer dip, there is no double dipping allowed. Last year, I opened my third donor advised fund, but only have two, since I no longer have any money in the T. Rowe Price DAF. Why did I open a Fidelity account? 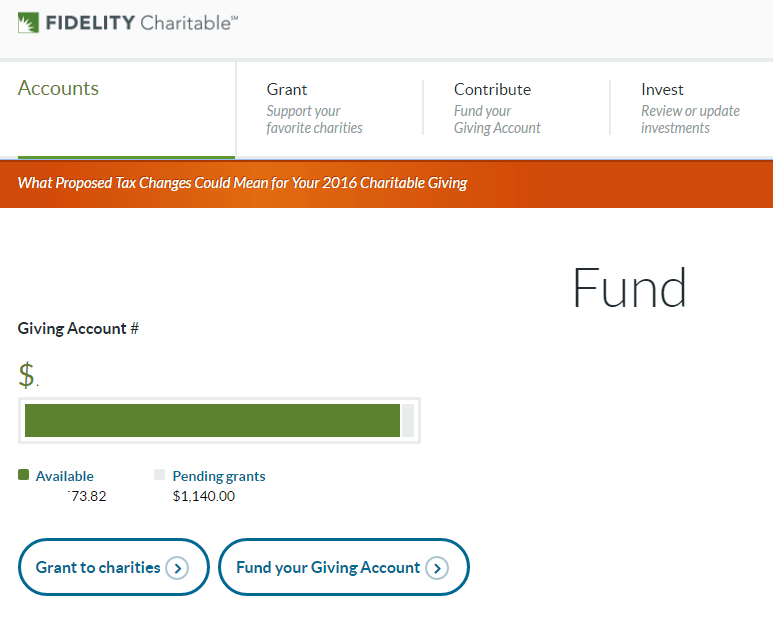 Fidelity Charitable allows you to give as little as $50 at a time, compared to Vanguard’s $500 minimum. The fees in both programs are nearly identical. Opening the fund using a grant from Vanguard Charitable was simple. 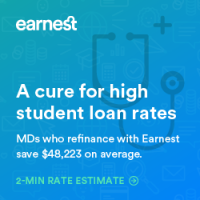 While you can start yours with as little as $5,000, you’ll be charged a minimum annual fee of $100 (from the fund’s value), which is a 2% fee when you carry the minimum balance. 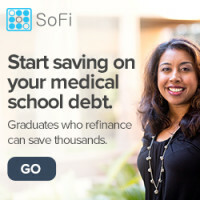 As mentioned above, you get more bang for your buck with a 0.6% fee at a balance of $16,667 and above. The giving process with Fidelity is very similar to Vanguard, and is nicely streamlined. 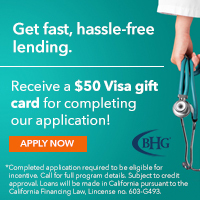 A new donation might take five minutes; giving to a previous recipient of your grant can be accomplished in a minute. Next, you will see a list of charities which have been on the receiving end of your grants in the past. It’s not nearly as compact as Vanguard’s, but couldn’t be any easier to read. Perhaps Fidelity assumes (or knows) that many of its donors are of an advanced age where cataracts become an issue. 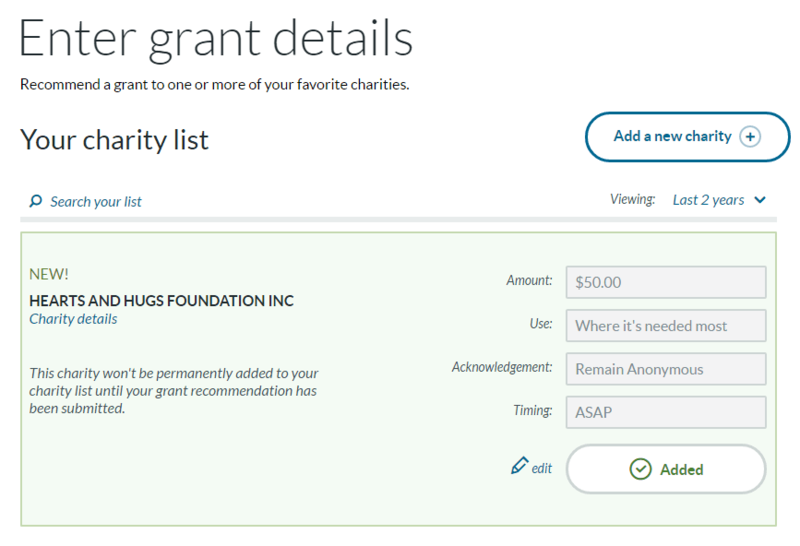 From here, you can fill in dollar amounts and add grants to previous recipients, or click the top button, “Add a new charity,” which is what I did. After searching for Hearts & Hugs, the information was imported to this screen. Note that I opted to make the donation anonymous, an option that Vanguard and presumably every respectable DAF will offer. 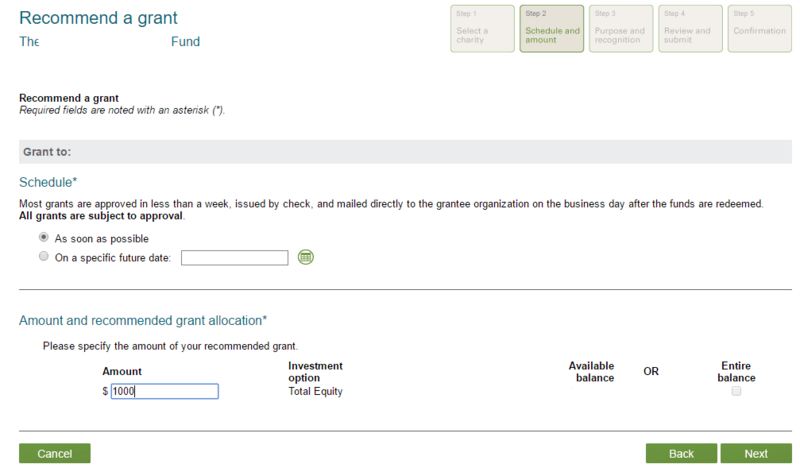 At the bottom of the screen was an option to confirm and submit the grant. I did, and received the following confirmation, which will again be followed up with an e-mail, letter, and likely a letter from the recipient. That’s all there is to it! 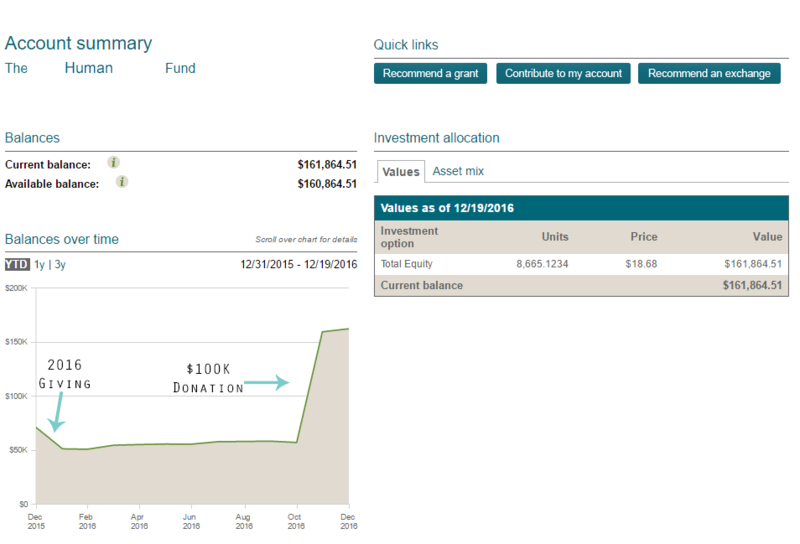 Both Vanguard and Fidelity make it simple to dish out your donated dollars. Subsequent donations to an organization you’ve supported previously are even easier. Speaking of support, if you support any of my advertisers or affiliate partners, I donate half of my site profits to charity, largely via my donor advised fund(s). I appreciate your willingness to help me grow this business. I hope I can inspire a few more of you to consider giving in the most advantageous way possible. Not only can the tax benefits be tremendous, but a DAF can also save you loads of time when you do your year-end giving. Have you used Vanguard or Fidelity Charitable for your DAF giving? What was your experience? Was it as easy as it looks? Comment below! Last night, we donated to 5 organizations in which we have personal involvement. Took 5 minutes. Contributed to a capital campaign recently, just as easy. Each time, Fidelity sends a letter to the organization. In addition, you can print out the letter yourself or save as a PDF. For “Commitment Sunday” in church, we my wife and I scheduled monthly donations for 2019. We put a copy of the letter in the pledge envelope, so it was clear for those tabulating pledges. Note: Fidelity makes it clear that their DAF cannot be used to pay a binding pledge. 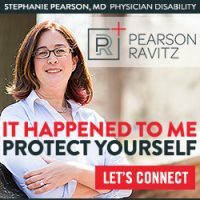 Great post and wonderful information. Disclosure,I am the chair of a local community foundation. 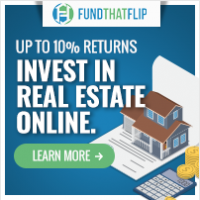 I would suggest readers also look locally to establish donor advised funds. Many community foundations offer the same services as fidelity and vanguard but the administrative fees help support local charities as well. 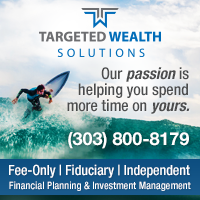 I have all of my personal money with fidelity and vanguard, but for my donor advised funds, I use our local foundation. I have the same ability to donate using online tool and to whatever charity I would like to. I’m going to second what Steven said above. I personally use Fidelity and enjoy managing the granting process, but people should look towards their local community foundation, especially as the donor advised fund grows and you want better insight on local organizations in your community. You can make a gift from a Fidelity/Vanguard/Schwab fund directly to the community foundation to establish your own fund. They can also plan for sustainable giving to organizations you care about after your death. Thanks for the mention. I think I set up my DAF about 15 years ago but I never talked to people about it. I think PoF has encouraged a lot of charitable giving just by writing about it. Kudos. 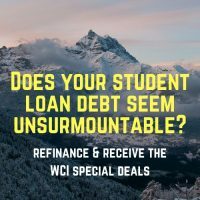 And WCI: I think people should get more than 50% credit. 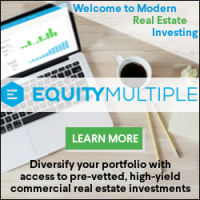 They either give now or they give a lot more later after investment growth. Either way they have given away 100% of that money when they didn’t have to. All they’ve got to do to get the last 50% is distribute it. No big deal since you already gave it away, right? I love my DAF. I do wish, however, that ongoing administration fees were lower. I find it odd that each of the three major DAFs has nearly identical annual administration fees if, in fact, the parent company isn’t profiting from (or subsidizing) the DAF activities. Logically, the firms could be expected to have different cost structures. With the 2017 change in tax law, more people may “bunch” their donations to DAFs into a single tax year. If the pace of authorizing contributions to charities from the DAF stays the same, that will result in people holding larger balances for longer in their DAF. I’d like to suggest that all DAF donors press the sponsors to reduce ongoing fees as much as possible so that the benefit to the charities is greater from our initial contributions. 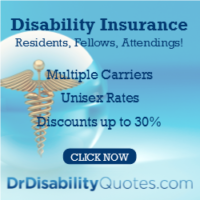 Although we don’t pay these fees directly, they do reduce what is available for distribution to charities. Whenever offered the opportunity to comment on your DAF, please consider mentioning ongoing administration fees. One comment on a separate issue: in case it wasn’t obvious from the article, if a DAF donor wants to transfer money from one DAF to another, it’s as simple as authorizing a contribution of the entire balance to the new DAF (which, of course, is a charitable entity). You don’t need to spend down a balance at your previous firm unless you choose to do so. Cheers & thanks for encouraging charitable contributions! 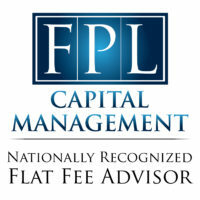 Want to minimize DAF fees? Distribute the money to the charity. Wouldn’t that defeat the benefits of using a DAF? If I wanted to do an immediate disbursement of all funds earmarked for a charity, I’d skip the DAF and donate the appreciated asset directly to the charity (all of the charities I support are able to process donations of marketable securities). I prefer the idea of making consistent smaller donations. You still get the convenience and anonymity benefits. But if your goal is to donate $50K in stock right now and dole it out $500 a month over a decade, you can do that with a DAF. I question the why (instead of just giving the $50K now) but that’s your call. The Schwab DAF has the same fees structure as Vanguard and Fidelity and also allows gifts as small as $50. The gifting process is similarly easy. 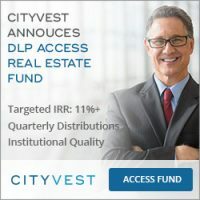 I realize that most folks are probably already using Vanguard or Fidelity for their other investing, but it is another good DAF option. 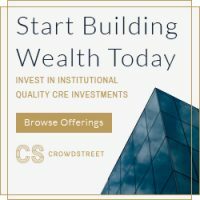 I chose it as I already had a Schwab brokerage account with some legacy shares received as a child with extremely low basis. That’s nice if you’re planning on small gifts. I think I’d just use cash for those rather than hassling with a DAF or donating appreciated shares. My experience with Schwab’s DAF is equally positive and simple to manage. Many charities we support do not have the ability to accept non-cash donations. Our DAF allows us to grant them cash, from a donation to our DAF of longterm cap gains securities, increasing the size of our grants, due to tax efficiency. 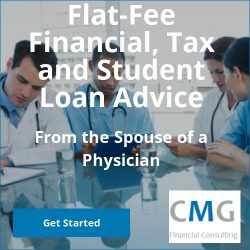 Depending on federal cap gains and state tax brackets, you may be able to donate as much 1.59 times as much from a DAF vs. a direct cash donation (based on top fed cap gains rate of 23.8% and top CA tax rate of 13.3%), YMMV. Many smaller charities would struggle if suddenly given a large donation, but will benefit from longterm, gradually growing support. 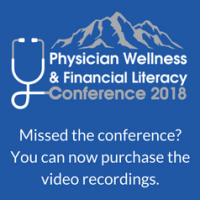 An analogy would be the financial issues some white-coats experience when jumping from a resident’s income to an attending’s income. A DAF is an excellent potential beneficiary of an IRA, 401K, etc. 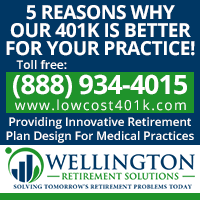 This can be a tax efficient approach to estate planning, for the charitably inclined, as no taxes will be paid on the IRA assets. 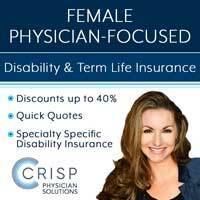 It allows for legacy support of charities, adjustments for adverse or positive financial events later in life, easy changes in charitable intent, etc. 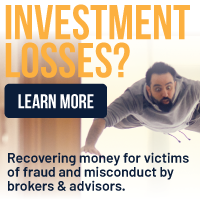 In some respects this is like a flexible, low-cost charitable remainder trust. I find the expenses charged by my DAF are much more than offset by reduced tax drag, reduction in paperwork and record keeping, reduction in tax prep costs, etc., so the DAF expense is not a hurdle. 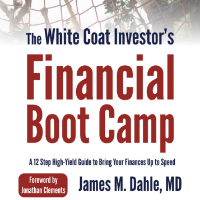 A DAF fund can allow better matching between high income vs. low income years. 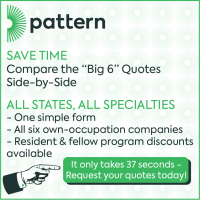 This is important when income is highly variable. I realize the alternative argument is just donate more to specific charities in the high income year, but sometimes the high income year comes as a surprise, late in the year and deciding what charities get a windfall should not be a rushed process. Thanks for an educational article. 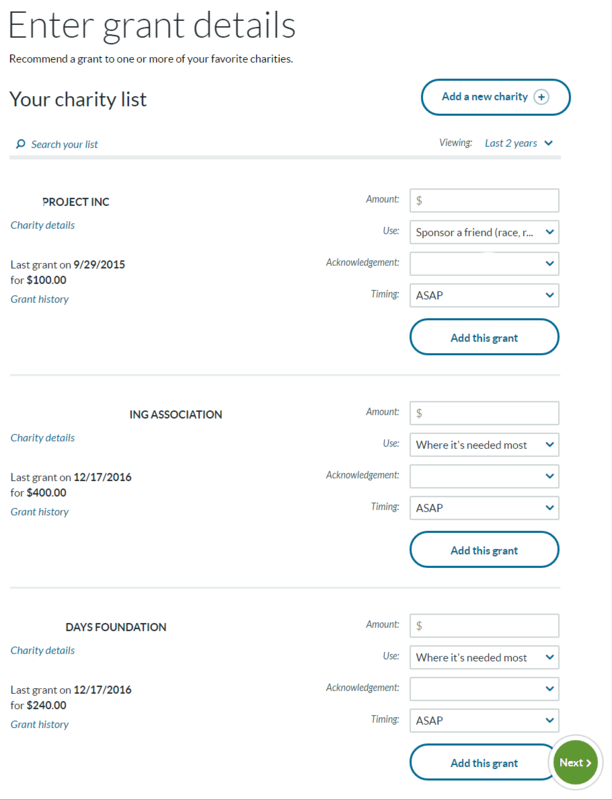 Used the DAF I set up at Schwab at the very end of last year to do all my 2018 donations this week, and I must say that I am very pleased with how easy the DAF makes the whole process. Almost every one of the organizations I donated to were in the Schwab database, so donating was only a matter of a few mouse clicks. It was way easier than it has ever been in the past (admittedly, I am somewhat of a techno-luddite who usually writes checks and stuffs envelopes since I am used to keeping track of payments in Quicken for tax purposes). If there is a downside, moving all the cash donations into the DAF means that all of the non-cash property donations don’t provide any tax benefit since they alone are not enough to push us above the newly-increased standard deduction. My wife is good with that, however, since her only tax-related job has been keeping records of those donations and estimating their value, a task that really annoyed her. 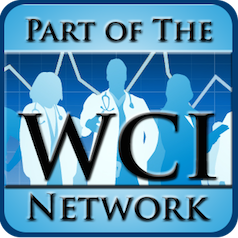 I disagree with WCI’s criticisms re not giving away all of the money up front rather than using a DAF to spread things out over several years, since priorities change over time and I value the ability to direct donations differently depending on what is going on each year with the organizations I intend to support. It will probably also warm WCI’s heart to hear that I probably ended up donating more money than usual since the cash wasn’t coming directly out of our everyday checkbook whose balance I have to monitor to make sure all of the donation and routine expense payments don’t end up causing checks to bounce. To me, the DAF appears to have the psychological effect of making the funds in it appear to be a sunk cost, so I feel free to write bigger checks. "I don't want the smartest guys managing my money, I want the luckiest ones. But since I don't know who those will be, I'll settle for the ones who skim the least off the top."